The final magnet girders are installed at Brookhaven's National Synchrotron Light Source II. Magnets traveled from across the globe, supplied by ring magnet vendors based in six countries: Buckley Systems Ltd (New Zealand), Budker Institute of Nuclear Physics (Russia), Danfysik (Denmark), Everson Tesla Incorporated (U.S.), Institute of High Energy Physics (China), and Tesla Engineering (U.K.). (Phys.org) —In January, the last of 150 magnet girders was installed in the storage ring of the National Synchrotron Light Source II (NSLS-II), capping off a tremendous yearlong effort in which 843 magnets were safely delivered, tested, and installed at Brookhaven's new light source. As the magnets arrived at the Lab, they were thoroughly tested and installed on girders, which were placed into the NSLS-II ring tunnel. During the early part of 2012 about two girders were being installed per week; as the year ended, that rate was three to five per week. These installations require painstaking precision to align the magnets properly. If the magnets are misaligned by even a tenth of a millimeter, the error is amplified and the orbit of the beam will be shifted by 10 times as much. The electron beam whips around the storage ring at practically the speed of light, and because the beam is so tightly focused, it is also extremely sensitive to small obstacles. At that velocity, if the beam encounters even the smallest of bumps, it can spiral outward off course and dissipate. "The machine only works if we confine the beam as close to the center of the vacuum chamber as possible, within a tenth of a millimeter from the center," said Ferdinand Willeke, Director of the Photon Sciences Accelerator Division. "In order for that to happen, we need to make sure that the magnets themselves are aligned much better than that." So, what does it take to align the hundreds of magnets needed to focus a high-energy beam of electrons traveling at nearly the speed of light around a half-mile ring? It takes years of planning, a team of incredibly skilled engineers and scientists, painstaking precision, and, in this case, a piece of wire. To find the true center of the magnetic fields created by the dipole, quadrupole and sextupole magnets that make together with the bending magnets up the heart of NSLS-II, engineers in the Accelerator Division lined the magnets up on steel girders and stretched a wire through their centers in the space where the vacuum chamber for the beam sits, Willeke said. "We powered one magnet and gave the wire an AC current, and if the magnet is misaligned, the wire will start to vibrate," he said. "Have you ever jumped rope? The wire oscillates like that, sometimes rotating twice or more times as frequently, creating a helix." As the engineers adjusted the magnet's position , they observed the wire's vibrations, which become smaller and reach zero as the magnets come into alignment. The surprisingly low-tech test was used in addition to laser trackers, which plot several points on the girders when the magnets are aligned to create a kind of 3-dimensional map for re-alignment once the magnets are settled in the storage ring inside NSLS-II. During the transport of an aligned girder from the assembly room to the accelerator tunnel, the alignment will be disturbed by deformations of even tens of microns. The laser trackers survey the girder's position to 10-micron precision, which allows engineers to restore the high-precision alignment in the tunnel. The surprisingly low-tech test was coupled with laser trackers, which plotted several points on the girders when the magnets were aligned, creating a kind of 3-dimensional map for re-alignment once the magnets were delivered to the storage ring inside NSLS-II. Making this happen was a large job, requiring the hard work and collaboration of many groups, both on and off site. 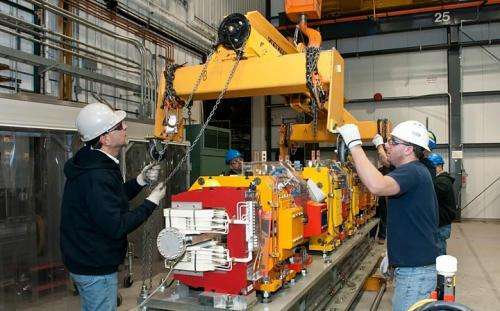 Ensuring that deliveries arrived on time and that magnets were being built according to the strict specifications sets by NSLS-II took constant communication and coordination between Brookhaven Lab and storage ring magnet vendors. Because NSLS-II has been under construction, girder assembly took place in a temperature-controlled room on site. There, engineers aligned the magnets – dipoles, quadrupoles, sextupoles and correctors – to within 30 microns of each other, or about as thin as a sheet of aluminum foil. Next, riggers used a crane to hoist each 20,000-lb girder onto a flatbed truck and drove to the ring building, where they moved it onto a set of dollies using a forklift. "It's a nerve-wracking trip from the clean room to the tunnel," Willeke said. The precise alignment of hundreds of magnets has to hold up during transportation and installation. During a trial run, in which the girders were transported around the Lab property and back to the clean room, engineers saw only minimal change in the wire's position when they repeated their test. "It only moved about 5 microns," he said. Final alignment and restoration of all the girders will be completed when the storage ring at NSLS-II is brought to a stable temperature. After four years of design and 14 months of installations, there's one last test to see if the alignment is as close to perfect as possible. "In the tunnel, we won't check the integrity of the alignment with a wire," Willeke said. "We have an even better instrument for verification – the beam. It will be visiting all these magnetic centers, and it will tell us very precisely if the alignment is not perfect."